The film's conspicuously irreverent style suggests that, blithe offenses aside, writer-directors Ron Clements and John Musker...have their heart in the right place: firmly situated in the anarchic comic tradition of Warner Brothers' Looney Tunes. 91 min. Buena Vista Distribution Company. Directors: John Musker, Ron Clements. Cast: Scott Weinger, Robin Williams, Linda Larkin, Gilbert Gottfried, Jonathan Freeman, Frank Welker. Walt Disney Animation's 1989 film The Little Mermaid ushered in a new era of studio classics built to entertain with flashy, mostly hand-drawn animation married to a Broadway sensibility that straddled the old-school and the modern. The coming of Aladdin, in 1992, didn't exactly signal the end of that era, but it did mark the passing of an irreplaceable talent, lyricist Howard Ashman. Ashman, who worked with composer Alan Menken to supply the lifeblood of The Little Mermaid and Beauty and the Beast (not to mention Little Shop of Horrors), died of AIDS at age 40, a year and a half before Aladdin's release, but not before contributing three songs that made the final cut: "Arabian Nights," the Oscar-nominated "Friend Like Me," and "Prince Ali." Ironically, Aladdin hits home video not so long after the loss of another irreplaceable talent: Robin Williams, who took his own life last year in the face of a degenerative illness. In what must surely be the best known and most celebrated vocal turn in Disney's nearly eighty-year run of animated features, Williams voiced Aladdin's Genie (as well as the speaking voice of the merchant who welcomes the audience and represents the Genie's once-free human form). Williams proves perfectly married to the role of a three-wish-granting showman who's busting out all over once rubbed free of his magic lamp by poor thief Aladdin (speaking voice of Scott Weinger; singing voice of Brad Kane). Aladdin pledges to use one of his wishes to free the long-indentured Genie, but first the "street rat" wishes to be a prince, the better worthily to win the hand of Princess Jasmine (speaking voice of Linda Larkin; singing voice of Miss Saigon's Lea Salonga). As the ingenues size each other up, Jafar (Jonathan Freeman), Grand Vizier to the Sultan (Douglas Seale), lurks in the shadows, plotting his own rise up the sociopolitical ladder. Fitting then, that his equally ruthless parrot should be named Iago (the ever-distinctive Gilbert Gottfried). The tale derives, of course, from the centuries-old folktale collection One Thousand and One Nights, and as in the past, Disney's widely-distributed appropriation and adaptation of a classic story read by children the world over led to artistic and cultural controversy. In particular, the film's opening number, "Arabian Nights," drew criticism, leading Disney to permanently replace the theatrical-release lyric "Where they cut off your ear if they don't like your face" with "Where it's flat and immense and the heat is intense" in all post-1993 releases of the film. And there's the matter of physiognomy, which arguably applies a coat of whitewash, except where it's expedient to exoticize. Your mileage will vary on the political correctness or incorrectness of Aladdin, and what constitutes a justfiable reaction or unjustifiable overreaction to it. Still, the film's conspicuously irreverent style suggests that, blithe offenses aside, writer-directors Ron Clements and John Musker (sharing screenplay credit with Pirates of the Caribbean scribes Ted Elliott & Terry Rossio) have their heart in the right place: firmly situated in the anarchic comic tradition of Warner Brothers' Looney Tunes. Hand off that football to Howard Ashman, Robin Williams, and animators like Eric Goldberg (who took lead on the Genie), and you get touchdowns like the Cab Calloway-on-crack Genie showstopper "Friend Like Me," surrounded by Williams' manic, partly-improvised riffs and celebrity impressions (from William F. Buckley to Groucho Marx, Robert De Niro to Arnold Schwarzenegger). That old-school Warner energy kicks in with the sprightly Aladdin intro "One Jump Ahead," featuring lyricist Tim Rice's spry Ashman impression. Rice and Menken also took home an Oscar for the requisite Aladdin-Jasmine love-ballad duet "A Whole New World," which remains to each new generation of youngsters a touchstone of swoony romanticism that's fun to make fun of (and secretly love). The voice talent shines all around (Freeman points the way for Jeremy Irons' equally silky villain in The Lion King), the five original songs charm (how fun is "Prince Ali"? ), and Aladdin's vaudevillian "Let Me Entertain You" razzle-dazzle—inseparable from Williams' blabbermouth muscularity—hardly ever lets up, making the 31st "Walt Disney Animated Classic" one of the most purely enjoyable. Disney has conjured up a spectacular Blu-ray + DVD +Digital HD Diamond Edition for Aladdin. A/V specs are outstanding, beginning with a high-def 1080p transfer that doesn't disappoint: sharp detail, deep blacks, and rich, vibrant colors highlight the picture, which has a few of the stray artifacts expected from animated titles (some banding, as in skyscapes, a bit of aliasing visible in the CGI elements...) but mostly gives a dazzling impression; this one's a beaut. As for the lossless DTS-HD Master Audio 7.1 surround mix, it leaves nothing to be desired. This robust track delivers everything we hope for from the aural home theater experience: discrete separation and placement of elements (prioritizing dialogue and lyrics), full-bodied fidelity to the music, and periodically thunderous LFE adding up to sweet, sweet ear candy. 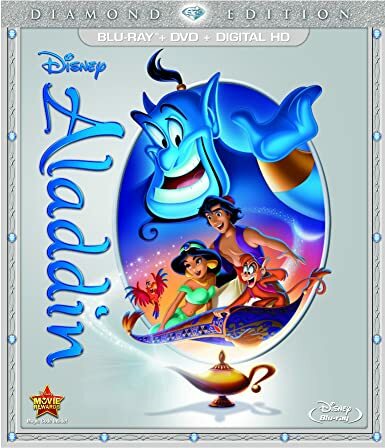 Other than a few minor subtractions from previous editions (galleries and games), this Diamond Edition offers a convincingly definitive package for Aladdin, with a whole new world of bonus features to go along with the archival extras. Kicking off the new bonuses is the featurette "The Genie Outtakes" (8:53, HD), with directors Ron Clements & John Musker and animator Eric Goldberg chatting about writing for and working with Robin Williams, as well as setting up audio outtakes illustrated with storyboards. Obviously, this constitutes a must-watch, with a lot of interesting "alts" and cutting-room impressions from Williams. "Aladdin: Creating Broadway Magic" (18:53, HD) turns out to be a surprisingly substantial look at the making of the hit Broadway production of Aladdin, including some discussion of the film's development and how a beloved cut Ashman & Menken number ("Proud of Your Boy") found a second life on stage. The featurette also frankly discusses the play's rocky tryouts on the way to an eventual high-flying triumph. "Unboxing Aladdin" (4:40, HD) finds young hipster Joey Bragg from Disney Channel’s Liv & Maddie pointing out Easter eggs in the film...TO THE EXTREME! "Genie 101" (3:59, HD) allows Scott Weinger, voice of Aladdin, to name-check for the uninitiated Robin Williams’ impressions in the film. Lastly, the very cute featurette "Ron and John: You Ain’t Never Had a Friend Like Me" (5:36, HD) sits Clements and Musker down on a bench at the Disney studio to discuss their nearly forty-year friendship. The pair's iron-clad friendship is entirely apparent as they talk over each other in recounting their first meeting, their penchant for "closing" restaurants, and each other's personality. Music Video" (2:20, SD), which comes with an "Original Story Reel" (2:18, SD) storyboard pitch and a "Behind the Scenes of the Music Video" (3:20, SD); “'A Whole New World' Performed by Jessica Simpson and Nick Lachey Music Video" (4:14, SD) with its own "Behind the Scenes of the Music Video" (3:46, HD); and "'A Whole New World' with Regina Belle & Peabo Bryson Music Video" (4:07, SD). "Disney Song Selection" (11:28, HD) is simply a glorified Scene Access menu, with optional on-screen lyrics, letting you jump to “Arabian Nights,” “One Jump Ahead,” “Friend Like Me,” “Prince Ali” and “A Whole New World.” For "Inside the Genie’s Lamp: Guided Tour" (6:13, SD), Iago goes inside the Genie’s lamp in this animated short that once prefaced a (now-absent) game on the Platinum Edition DVD. A second animated short, "The Genie World Tour" (3:14, SD) observes Iago and Jafar perusing postcards from the Genie. The Filmmaker’s Audio Commentary with Musker, Clements and co-producer Amy Pell and Animator’s Audio Commentary with Andreas Deja, Will Finn, Eric Goldberg and Glen Keane return from the Platinum Edition, as does the extensive and entertaining making-of documentary "A Diamond in the Rough: The Making of Aladdin" (1:10:52, SD). "Alan Menken: Musical Renaissance Man" (19:55, SD) profiles ones of Disney's most respected composers, while "The Art of Aladdin: Art Review with Filmmaker’s Commentary" (8:45, SD) tasks Musker and Clements with taking us through the concept art that evolved into the finished product. Rounding out the disc is a Publicity section with the "Original Theatrical Trailer" (2:50, SD), "The Return of Jafar" trailer (:43, SD), and "Aladdin and the King of Thieves" trailer (1:30, SD). All site content © 2000-2019 Peter Canavese. Page generated at 04/21/2019 01:23:24AM.